JUBA, Apr 28 2012 (IPS) - As thousands of people flee the conflict in South Sudan’s northern border states, increasing numbers have also been forced to leave their homes and towns in search of affordable food. As tension between South Sudan and Sudan continues in the South Sudanese northern areas of Unity, Upper Nile, Northern and Western Bahr al Ghazal states, the conflict has more than doubled the price of basic commodities, making it difficult for many here to afford. In the border town of Bentiu, the price of a 50-kilogramme sack of sorghum has increased from 10 dollars to 24, while a kilogramme of sugar has tripled from one to three dollars. “Traders who used to bring in these goods from Elobeid in Sudan’s Southern Kordofan state are unable to do so now because the border is closed,” he added. For the last month, traders who usually import foodstuffs from Southern Kordofan in Sudan have been victims of violence along the route to South Sudan. Many have stopped trying to cross the border altogether. 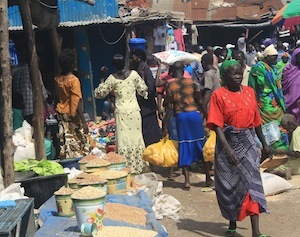 The rapid increase in prices of consumer goods has forced residents of Bentiu, which is the capital of Unity state, to flee to towns in South Sudan’s greater Equatoria region, where consumer goods imported from East Africa are in abundance and relatively cheaper. The southern states of Western, Central and Eastern Equatoria share borders with the Central African Republic, the Democratic Republic of Congo (DRC), Uganda, Kenya and Ethiopia. “Many people here are moving their families to Juba and Yei, in Central Equatoria state, because they can no longer afford food,” Bonifacio Taban, a local journalist in Bentiu, said. Fighting between South Sudan and Sudan took a turn on Apr. 10 when South Sudan occupied the disputed oil-producing town of Heglig, in Sudan’s Southern Kordofan state. Both countries have laid claim to the town, which lies in a border area. According to South Sudan’s Minister of Information Barnaba Marial Benjamin, the country occupied Heglig to stop Sudan’s military, the Sudan People’s Armed Forces or SAF, from continuing to launch ground and air attacks from the area. The South Sudanese army, the Sudan People’s Liberation Army (SPLA), were ready to withdraw provided that international monitors were sent to Heglig and Sudan agreed to international arbitration to determine which country owns the area, he had said at the time. However, after South Sudan’s withdrawal on Apr. 23, the country says that Sudan has continued attacks. Unity State Governor Taban Deng Guy said this week that 75 people had died in aerial bombardments in his state in the last few months; it includes casualties in Bentiu town and other parts of the state. In the same state, thousands of civilians have been displaced following ground clashes between the SPLA and the SAF, and aerial bombardments by the latter. South Sudan’s Deputy Minister of Humanitarian Affairs and Disaster Preparedness Sabrina Dario Okolong said that residents of Unity state are fleeing the aerial bombardments in the northern part of the state and were making their way south to Nhiakdiu, Mayendit, Leer, Koch and Guit counties in search of safety. “We also have about 1,500 people who have been displaced from Pariang County (a county in Unity state that borders Heglig) and we have the United Nations agencies verifying 1,693 IDPs in Pariang and 303 IDPs in Panyang,” Okolong said. Panyang is an administrative unit comprised of a number of villages within Pariang County. An aid worker, who did not want to be named, estimated that 5,000 to 10,000 people had become internally displaced in the state. The death toll from the conflict is not known, however, the U.N. says after South Sudan withdrew from Heglig, 16 civilians were killed in air raids and ground attacks within Unity state alone. Dozens of foreign traders from Kenya, Uganda, DRC, Ethiopia and Eritrea are fleeing Bentiu where, on Apr. 23, SAF warplanes bombed a market and a bridge killing four people and wounding four others. Makosa Kabanga, a Congolese trader who arrived in Juba from Bentiu on Apr. 24, said he was scared to stay in Bentiu because of the air raids. “We were five Congolese who left Bentiu for Juba late last week. We feared the fighting in Heglig. Although Bentiu was a bit far from it, it was too much for us,” he told IPS. “We feared that there was going to be bombing in Bentiu and that’s what happened after we left. We will only return to Bentiu when the fighting and bombing stops,” he said. But in South Sudan’s capital city of Juba some commodities are not so easy to find. Fuel stations have run out of petrol and there are long queues of motorbikes and cars as people wait their turn to purchase the commodity, which has almost doubled in price since the fighting intensified. “We used to buy a litre of petrol at one dollar but now it costs more than three dollars,” Moses Taban, a motorcycle taxi operator, said. An oil dealer in Juba, who spoke on the condition of anonymity for fear of repercussions, said he believed that there is a shortage of petrol because the SPLA purchase large quantities of fuel from him recently. “The SPLA bought hundreds of thousands of litres from us. It takes time to bring in more fuel from Kenya… that is why you are seeing a shortage,” he said.